The Miller Armstrong Conference Center has two comfortable and fun options for spending the night in Waseca, Veterans Landing Cabins and Millers Bed and Breakfast. (Call 507-835-1146 for reservations ). The M-F line is also the main office number of ELM Homes. The cabins and the house have all been beautifully remodeled. The walls and ceilings are all cedar-lined and feature ceramic tile floors. Each cabin has a kitchenette, including a full-sized stove and refrigerator, kitchenware, microwave, coffeemaker, and toaster. Freshly pressed, clean linens are included. All of our cabins have extended cable and VCR/DVD players. If you stay in the house, you will be able to enjoy a whirlpool bathtub. The cabins and house are smoke free and there is a canoe available for you to use in Loon Lake. We also welcome pets at a rate of $10.00 per day. We do require a refundable $200.00 pet deposit in case of any damages. 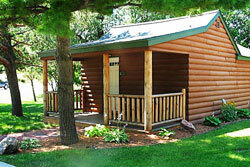 Enjoy a comfortable yard and a gorgeous view of the lake from any room of your cabin. Get away for a relaxing night, weekend, or an entire week at our newly renovated Bed and Breakfast Suites. The suites include a fireplace, king-sized bed, table with two chairs, cable, and wireless internet access. Three of the suites have two over-stuffed chairs. Suite #4, features a whirlpool bathtub to soothe those sore muscles and a romantic setting for couples. All of our suites are smoke free. You receive a $10 voucher to be used at Jonnie Beans, Club 57 or Starfire Grill.